Killing time at the AV Club site while waiting for my dinner to cook, I noticed a link to an Insider article titled “Why Can’t Michelle Rodriguez Stay Dead?” Naturally I clicked it as hard as I could… and almost had a nerdgasm when I realised what it was about! 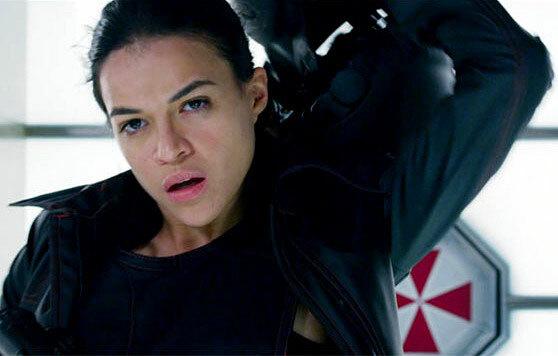 As you might have surmised from my lackluster review of the last Resident Evil movie (Afterlife), I was starting to get a little tired of the franchise and its arbitrary plotting, so I probably wouldn’t have bothered watching the just-released trailer for the fifth instalment (Retribution) of my own volition… but ohmygod, ohmygod, ohmygod, M-ROD IS BACK!!! Don’t ask me how, don’t ask me why, ‘cuz I don’t care… Rain Ocampo lives to sneer and glare another day!!! And I’ll only have to wait another eight months (or so) to see it for myself… ack!!! MULTI-SPOILER: In recent years M-Rod’s high mortality rate in movies (and TV shows) has become a bit of a running joke, but that’s set to change according to The Insider, as more and more of her deceased characters come back to life for no apparent reason. Hurrah! Unless they’re just bringing her back so they can kill her off again… in which case, boo! Oh, and to answer the question posed in the article’s title: Because she’s too awesome to die, that’s why! This entry was posted in Rants about Films and tagged Michelle Rodriguez, Rain Ocampo, Resident Evil, Resident Evil: Retribution. Bookmark the permalink.